Join Michele O’Mara, PhD in an intimate 3-hour Austin Lesbian Relationships 101 experience. This is an introductory workshop for both single and partnered lesbian couples who are interested in learning more about what it takes to create a happy, satisfying lesbian relationship.
? Understanding what’s driving your attractions. Learn what your imago is and why it matters when it comes to relationships. Discover how to turn your greatest frustrations with your partner, previous partners, and even friends and family into one of your most powerful tools for personal growth. Identify five common challenges in lesbian relationships, and how to anticipate them and find alternatives that work better. Each participant will be provided a mini-workbook to take home with you.
? Levity/laughter, new friends and fun! Perhaps most important of all is that this intimate (and when you see the space, you’ll know I’m serious about my word choice – “intimate”) experience is sure to be a safe space to learn, and my personal philosophy is that we learn best when our learning is tied to positive, novel and enjoyable experiences. Similar to vacations… we remember our vacations for years because they are uniquely feel-good experiences, and that is the environment I seek to create, a mini-vacation with new friends, novel experiences and lots of great discoveries. AUSTIN Lesbian Relationships 101 is an opportunity to gather with other women to learn more about what happens in a typical lesbian relationship. While we are certainly a diverse population of women (contrary to the many stereotypes), our issues in love are not quite as special or unique. We are all struggling with similar concerns, patterns of behavior, and challenges. 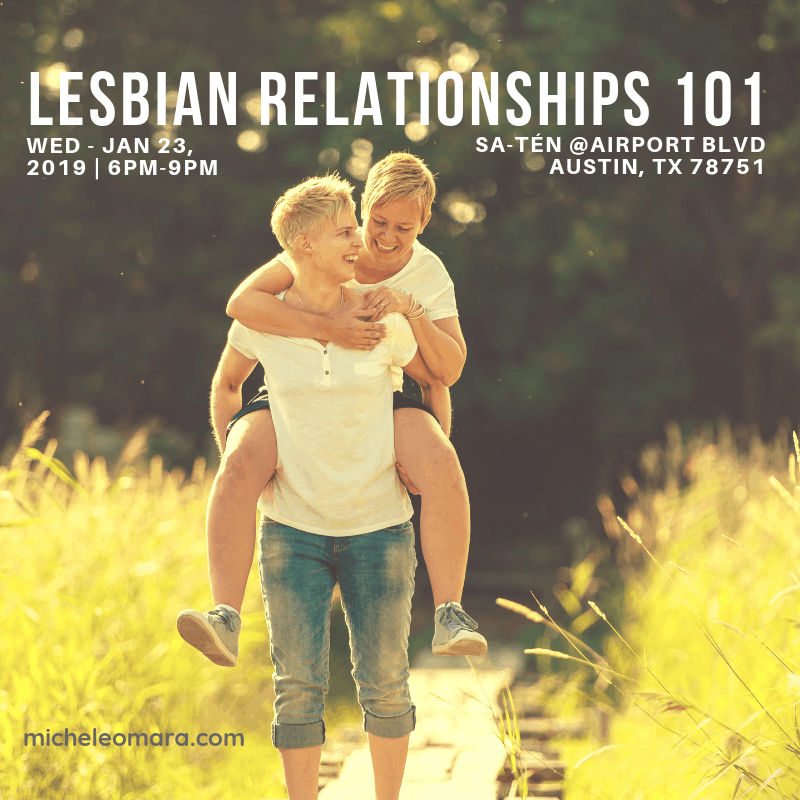 This Austin Lesbain Relationships 101 mini-workshop is designed to normalize lesbian relationships and offer you information and tools to navigate them more successfully.